It's a long drive on any day of the week to Rhosneigr, especially from Bournemouth. In fact there are very few places that it isn't a long drive from. Rhosneigr, Perched on a small corner of Anglesey in North Wales, don't ever be in a hurry to get there. I have a particular soft spot for Rhosneigr. In the early 90's it was my main windsurfing haunt as it was just down the road from Bangor where I went to Uni. Even from there is was a long way away as the roads were mainly single carriage, the sign posts in Welsh and I could rarely remember the way. Fast forward 20 years and I find myself once again on the same long drive reminiscing "Oohh haven't things changed". Actually they hadn't at all, but I think that is what people say when they get older. For one, there was still a massive traffic jam on the M6, had they been there this whole time? This meant once again I opted to go through mid Wales and get duly lost. The whole weekend though was great fun. Bucky a really good host and the conditions good enough. Not the classic of a couple of years ago but just about contestable. However I was happy, I actually won. Not the whole event, that would be Adam Lewis in the Pro fleet. But I came first in the amateur fleet, which I demoted myself too about 10 years ago after getting a real job. The amateur fleet is actually heaps of fun, and if you win it you get to sail a lot more rounds and also win a mast extension, something I was particularly grateful for. Turns out though, if I win the fleet overall I will have to go back to the Pro Fleet, where I will no doubt get to sail significantly less rounds and definitely not win anything of any kind. Unless of course I do a Leicester. Which I quite fancy doing. Usually, in the past (there I go reminiscing), I take quite a bit of notice what is happening on the water in other heats, hailing back to the days where I would do event write ups. I have to say that in this event I really didn't notice much at all. Even that my first heat had started. At that point in time I was sipping a coffee in the Café with Phil Horrocks. Talking about kids, doing up houses and the like. By chance I said, "well I must have ages till my heat if they are doing the Pro double first". Phil replied, "I don't think they are, think they are mixing the heats in". Ah, so I rushed to the beach. "Geoff, which heat is running now", "Your's Clyde" he replied. Bugger, bugger I can't come last, that would be awful. I mean, 6 hours of driving, the traffic on the M6, the reminiscing. For nothing. Actually change that slightly, 6 hours of un interrupted peace and quiet. The key thing in a heat is too stay calm and keep your heart rate down. That way you wont cramp up and flap around. I just had less time to do a good heat. Luckily though, to the end of my heat, the judges cancelled, the wind had dropped enough to make it hard for jumping. So they changed it too wave riding only. Two waves to count. This gave me 5 minutes 20 exactly de rig my 4.5. Get boom and extension and rig up my 5.3. Bugger, late for my heat again. 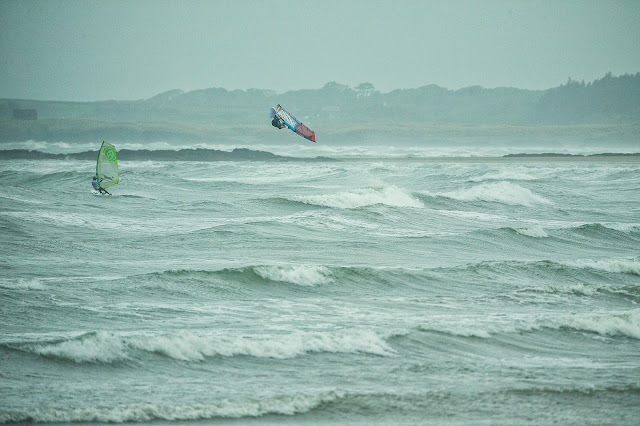 But the added power was worth it, I picked up a couple of good waves and managed to get some half decent turns and a few sections and win the heat. I can't really remember the final. I think I picked up some decent sized waves, but it was so hard to tell what others were up too. Turns out I did alright. Adam Lewis rightly won the Pro fleet, with new Simmer Rider Phil Horrocks in second. Andy Chambers came third and James Cox fourth. 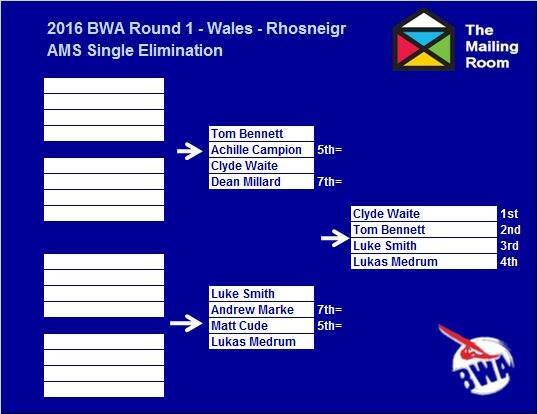 Andy and James didn't get to sail their double elimination heat, so I am sure that is a battle for next time. In the Ladies, Simmer rider Sarah Hilder took the victory. So it would seem that the only conclusion I can make, based on all the evidence, is that the sails used are the common denominator. The next event is Tiree, one that us teacher folk cant really get too. I might try though. After that is Cornwall, which I am already booked to go too. Along with Gregg Dunnett and Emile Kott. Looking forward to that already. (I already know they will probably knock me out in the first round and dash my hopes of winning my only ever title since I was 18)!!! Thanks to Nigel, Geoff from BWA and Bucky from Funsport, plus all the event crew. Also Thoughts to Tom and Rosie. Rosie had a very lucky escape. We are so pleased to hear that you have recovered well and hope that you can get back on the water soon. There are plenty more pictures on the British Wavesailing Association facebook page to have a look at.